You can find my future shows and festivals in my home webpage. Shopping when I'm in between shows? 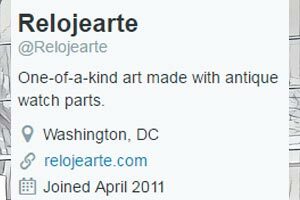 You can contact me by email and I can confirm if I have the artwork that you are interested in. 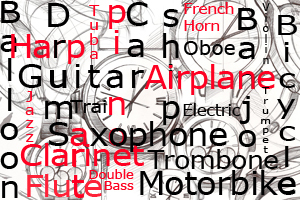 For coustom work, I focus in pieces featuring Means of Transportation and Musical Instruments. I need between 3 or 4 weeks to make your coustom piece. Please don't hesitate to contact me for any futher information. After our second visti to New York, we had awarded with the first place in MixMedia category with this piece featuring a Hardley Davison motorbike. We have been present at the Downtown Holiday Market for 6 years. This Christmas Market is very popular in Washington DC area it is a great place to find that special gift for Christmas! I hope to see you there in December 2018. 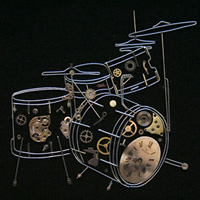 For more details please check the "Upcoming shows" section at the bottom of the home page. 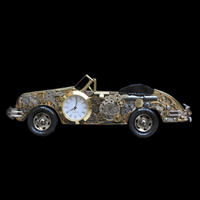 Antique watches, modern and timeless art. I have been settled in Washington DC since 2008 after 40 years of sharing this family work with customers all over the world. It all started in Uruguay where my father-in-law created the first of this unique pieces. 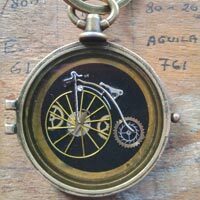 The gears found in the antique watches insipired him to capture the movement and the exquisite intricacy in automobiles and other machines. 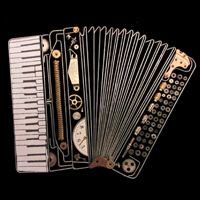 I have always admired the aesthetics of muscial intruments and I combined the notion that the time - tempo - in music sets the mood of a piece, to create musical instruments with watch parts. I want my pictures to transmit these ideas as well as allow the viewers to find their own connection. 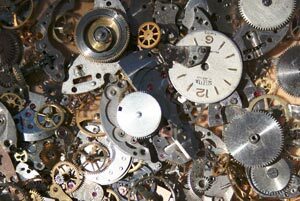 Our pieces are made individually using mostly vintage watch parts. All these pieces are one of a kind so the photos represent the designs I create. If you like to purchase a piece please email me and I can provide more information abou the pieces I currently have in stock or visit me at any of my upcoming shows listed below of the home page . Custom work is also available. 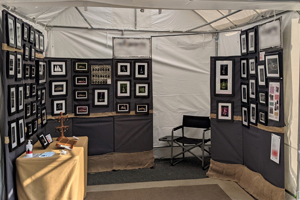 Walk the streets of downtown Rockville as it is transformed into a brilliant spring outdoor art gallery highlighting the industry’s best local, regional and national artists. See the industry’s best in glass, ceramics, jewelry, painting, photography, sculpture, woodwork and more. 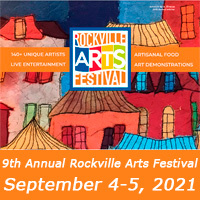 The 7th annual Rockville Arts Festival (formerly A-RTS at Rockville Town Square) creates an outdoor art gallery on the streets of Rockville Town Square, Rockville, Maryland (Maryland Ave, E. Middle Street and Gibbs Street). Streets are closed to traffic for the Festival. The Festival is in easy walking distance from the Rockville Metro station (Red line) and numerous garages are conveniently located around the site. 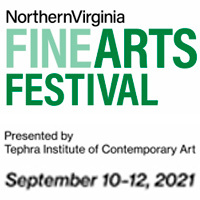 We are glad to anounce that for first time we are invited at Nothern Virginia FineArts Festival. The Northern Virginia Fine Arts Festival, now in its 28th year, is one of thr "top five"outdoor art festivals in the country with a long-standing reputation for showcasing hight-quality hand-crafted, one-of-a-kind artwork in a dynamic outdoor setting that draws affluent and knowledgeable clientele. This unique event is presented in Reston Town Center. 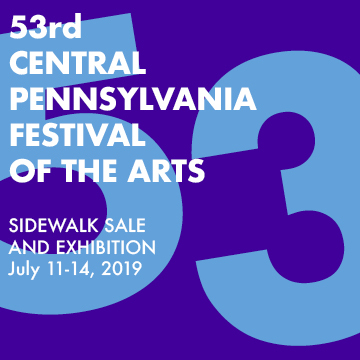 The Central Pennsylvania Festival of the Arts is an art lover’s dream! Whether shopping for a unique gift, or looking for something for yourself, our Sidewalk Sale and Exhibition is the place to be. You’ll find over 300 of the country’s best artists selling a wide variety of fine art and fine craft. If you want to see artists at work, be sure to check out our Italian Street Paintings at their new location on Foster Avenue and our giant sand sculpture in Sidney Friedman Park. Watch as our street painters and sand sculptor make magical creations–perfect backdrops for your Festival selfie. And finally, don’t miss our juried fine art gallery exhibition, Images 2019, or our banners hanging high in the air over South Allen Street!